Week eighty four, or should I say week eighty four and a half as this week’s bake was done in two halves. I actually made the brandy snaps last weekend but didn’t find the time to blog about it so incorporated it into this week’s bake and blog. 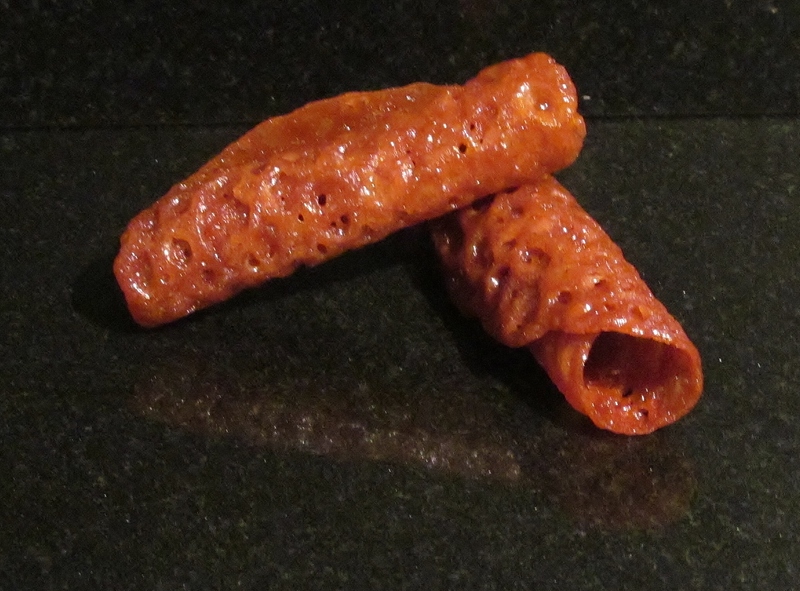 I was inspired to try the brandy snaps after watching one of the celebrity master chef episodes where each celebrity was given the challenge of producing a brandy snap, with quite hilarious results. So I delved into Mary Berry’s Baking Bible and found the recipe and off I set. On celebrity master chef, the celebrities were given a dough and asked to make it into a brandy snap. Mary’s mix is quite liquid in comparison. So much so that I thought I had done it wrong initially but when I put teaspoons of the gloopy mix on the baking tray, it produced the desired effect and I was able to roll them into a brandy snap and leave them to cool. I served mine with ice cream and yes, they did “snap” when bitten into! 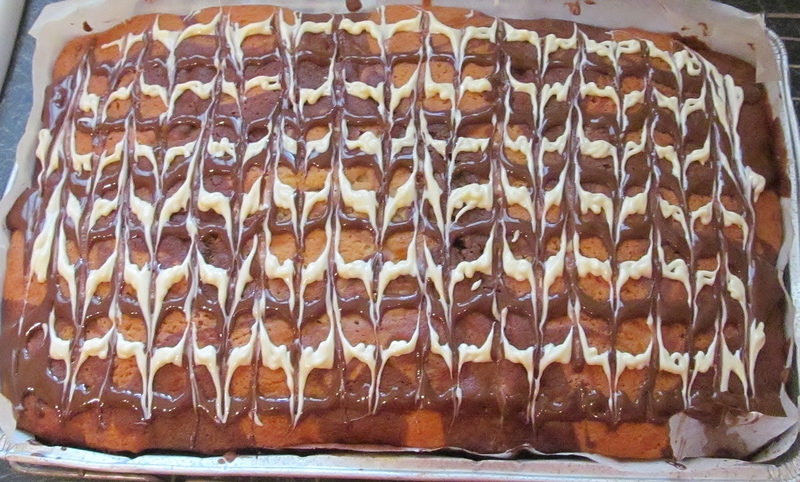 The second recipe, made this week was Mary Berry’s chocolate chip & vanilla marble cake which is made into a tray bake. 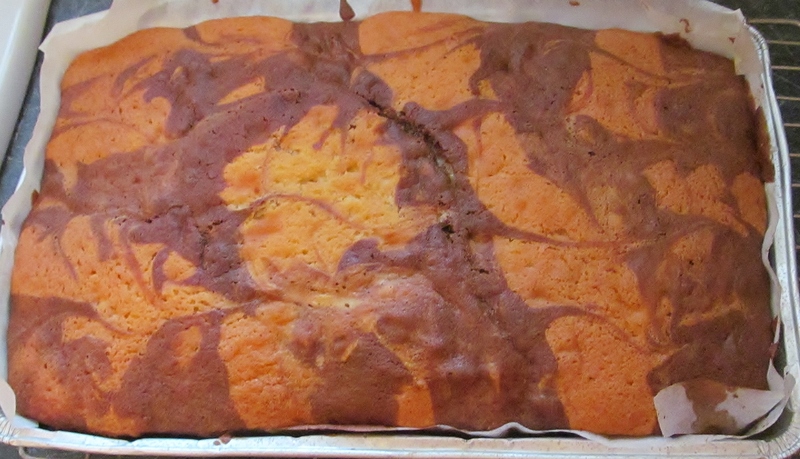 The basic cake mix is one of Mary’s mix everything together all in one mix ….but with a variation. Mary then asks you to place spoons of half this mixture in random places in the tray and then add the cocoa and hot water and chocolate chips to the other half of the cake mix and mix again, then place spoons of this in the spaces left in the tray. I then used a spoon to ripple it all together. One tip I have learnt with adding chocolate chips is to roll them in flour before adding them to the mix and this should prevent them all sinking to the bottom which has happened to me so many times. It definitely seemed to work this time. Once the cake was baked, I left it to cool. The countdown continues…and YAY! I have now got 99 left to go- down to two figures at last! This entry was posted in Kim's cake challenge and tagged Baking Bible, brandy, brandy snaps, Chocolate chip, Kim's Brandy Snaps, Kim's Chocolate Chip & Vanilla Marble Cake, kims cake challenge, marble cake, Mary Berry, Mary Berry's Baking Bible, Mary Berry's Brandy Snaps, Mary Berry's Chocolate Chip & Vanilla Marble Cake, vanilla by kimsideas. Bookmark the permalink.